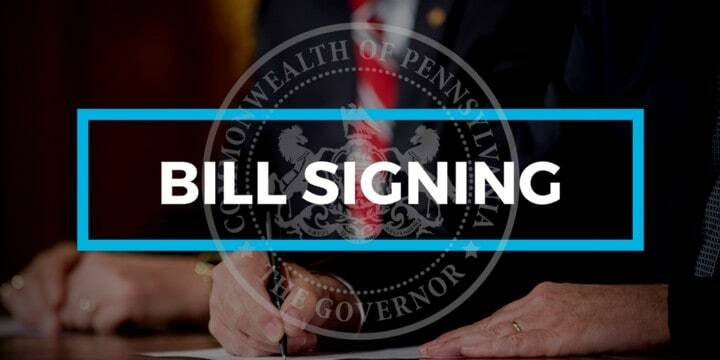 Harrisburg, PA – Today, Governor Wolf signed a number of pieces of legislation. Act 61 (Metzgar) – Amends the Storage Tank and Spill Prevention Act, in financial provisions, further providing for Underground Storage Tank Indemnification Board, Environmental Cleanup Program, Pollution Prevention Program, and costs. Act 63 (Walsh) – Act authorizing the release of Project 70 restrictions on certain land owned by the Borough of West Newton, Westmoreland County; and on certain lands owned by Upper Uwchlan Township, Chester County. Act 64 (Gillen) – Amends Title 9 (Burial Grounds), in general provisions relating to burial grounds, further providing for definitions; & providing for transfer of ownership of cemeteries & for reasonable access to burial grounds. Act 65 (Turzai) – Amends Title 66 (Public Utilities), in rates & distribution systems, further providing for rates to be just and reasonable; & providing for water & sewer authorities in cities of the second class.